On this day in 1945, one day after the official end of World War II, Hermann Göring was arrested while on the run in the town of Zell-am-See in the heart of today's Austria (near Austria's highest mountain Grossglockner). On this day the Allies arrested one of the most prominent Nazis – Hermann Göring. One of Hitler’s closest associates, Göring became famous already during World War I. Namely, as a military pilot he shot down 22 Allied aircrafts and became a flying ace. For these achievements he was even awarded with the very respectable “Blue Max” (officially titled “Pour le Mérite”). He was the last commander of the fighter wing which was once led by the famous “Red Baron” Manfred von Richthofen before his death. When Hitler came to power, Göring received numerous high positions. He became minister of aviation and commander-in-chief of the German air force – the famous Luftwaffe. He got a higher rank than any German field marshal or admiral. The rank was called Reichsmarschall (Reich Marshal) and Göring was the only one to be awarded it. On this day in 1945, one day after the official end of World War II, Göring was arrested while on the run in the town of Zell-am-See in the heart of Austria (near Austria’s highest mountain, Grossglockner). He was taken to trial at Nuremberg. Interestingly, the prison psychologist who tested him measured that had an IQ as high as 138. 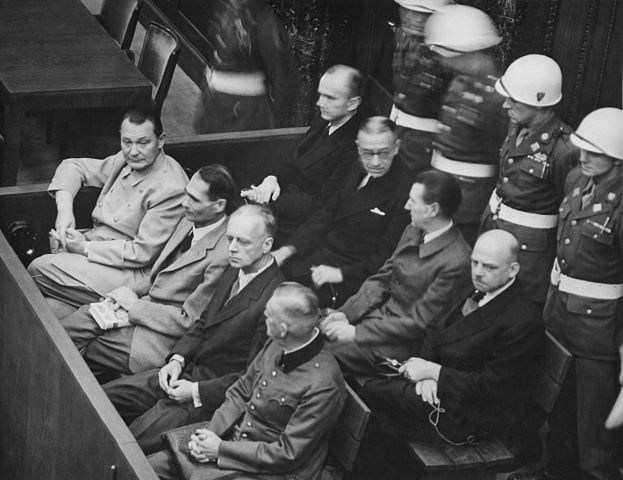 The Nuremberg court sentenced Göring to death.